When I was a kid in the 1980s, “screen time” wasn’t really a thing. Personal computers were rare, expensive things that few people had and were mainly for business. Telephones were “dumb” and tethered to the wall, and television offered 13 channels, many of which were snow. Today, my kids have a staggering amount of media and entertainment available to them at all times. As a parent, I struggle with raising the first generation of kids to never know a day without the internet, pocket-sized computers, and on-demand entertainment. It’s not easy to manage but oh, so important to do so. Research has demonstrated the dangers of unbridled screen time. A study recently conducted by the Kaiser Family Foundation found that “…children [between the ages of] 8 to 18 spend, on average, close to 45 hours per week watching TV, playing video games, instant messaging, and listening to music online.” That’s more time — far more — than they spend in a classroom. What’s the result of all this time spent staring at a glowing rectangle? As of this writing, it’s hard to say. Since this issue is so new, there haven’t been a lot of longitudinal studies conducted. But research is being done. A study published in the journal Computers in Human Behavior suggests that sixth graders who abstained from screen time for a period of time were better able to read human emotions than those who did not. So how can we stay on top of it? Organize a healthy “media diet” with the kids. Here are a few ideas. First, be aware of what’s age-appropriate. Know what they’re watching, playing, and listening to. I know it sounds obvious, but new entertainment comes out so often, we as parents must actively stay up to date. This doesn’t just go for content. While digital entertainment is being made for two-year-olds, the American Academy of Pediatrics recommends no TV or computer screens (including phones and tablets) for that age group at all. Next, set family rules and stick to them. Our rule is this: two hours of screen time after dinner and that’s it. Of course, this is considering that all homework is done, lunches and snacks are prepared, and bags are packed up for the next morning. Both parents must be consistent with rule enforcement here. This leads me to the next tip. No media in bedrooms. You can’t monitor your children when they’re in bed. If a phone or tablet is at hand, the temptation may be too great to pass up. So far I’ve put all of the focus on the kids. That’s important, but phone-addicted parents need a reminder to put their devices down, too. A recent study noted that kids can feel unimportant when their parents spend so-called “quality time” looking at a phone . Face-to-face interaction is the way children learn. I guess we could all do with a little less screen time. Manage the amount of time your kids — and you yourself — spend looking at a phone, tablet or computer screen. It’s Tsunami Preparedness Week in California, where I live. Since my home is near the coast, I decided to take another look at what’s recommended for those who live in — or visit — areas which may be impacted by a tsunami. The Red Cross has a three-step plan describing how to prepare for all sorts of emergencies: fire, hurricane, earthquake, etc. It’s a useful framework that can be tailored to whatever scenario you’re planning for, including a tsunami. If you’ll never face a tsunami risk, you may want to do the same thing for the risks that affect your area. You can find many resources on preparing a kit for emergency situations: an evacuation or a need to stay at home without access to your normal stores and services. You can buy pre-packaged kits or assemble your own, making sure to accommodate the needs of any children or pets. If you live or work in a tsunami zone, you’ll probably have hours to evacuate if a tsunami arrives as a result of an earthquake far away. However, a strong local earthquake might cause a tsunami with very little time to prepare. And you may need to evacuate on foot, if at all possible, since roads may be damaged or clogged with traffic. This means you’ll want a portable kit with the real essentials ready to grab and go. A kit for work might need good walking shoes. One of my two cats is about 18 pounds, so I’m not sure how I’d carry him if I needed to evacuate on foot. (His normal carrying case would be unwieldy to carry for any decent distance.) A wheeled carrier or a backpack, maybe? Fortunately, since I’m just outside a tsunami evacuation zone, I don’t need to worry about that. Your tsunami plan, if you need one, would include both evacuation and family communication. Be sure to understand what plans are in place for any of your schools or workplaces that may need to evacuate, so your personal plans can incorporate those other plans. It helps to practice traveling along any chosen evacuation route so you can travel it without a lot of thought, even if it’s dark or the weather is bad. For some disaster situations you can take steps to help minimize the risk. There are a number of ways to make your home a less dangerous place in an earthquake. If you live in tornado country, you may be able to build a safe room. In a tsunami situation, there are no equivalent steps you can take. However, your plan might involve buying flood insurance if your home is at risk. If you live or work near the coast, you’ll want to know if your home, workplace, or school is in an evacuation zone. For those in the U.S., you can find the relevant maps online. You’ll also want to know about any designated evacuation routes and safe gathering spaces, as well as your community’s warning plan. If you’re a tourist, you’ll want to be aware of evacuation procedures in the area you’re visiting. And both residents and tourists will want to know the warning signs of a potential tsunami, since warning systems might not have time to alert you about a tsunami generated by a local event. The California Governor’s Office of Emergency Services has a good list of these warning signs: strong long-lasting ground shaking from an earthquake, unusual sea-level fluctuations, an abnormally large wave, or a loud ocean roar. It took me a couple hours of searching the web and reading reliable information sources to feel like I understood my tsunami risk and what I should be doing, just in case. I think it was time well spent. What does one do with old pictures of actors, and Broadway programs and playbills? This is a great question and it also encompasses programs and photos from other cultural events such as posters from special museum exhibits, sporting event programs, and photos from themed conventions (e.g., Comic-Con, etc.). The first question to ask yourself is, “Do I still want to keep these items?” If you decide that you want to part with some or all of these items, then here are a few ways to do that. Friends/family: Pass items along to friends or family members who show an interest. Include a brief description of the item’s history; how you got it and why you kept it. Aficionados: If you belong to a group of theatre-goers or a fan-club, other members of the group may be interested in your items. If you’re not a member of a fan group, you could contact a local club and let them know what items you have to sell or donate. Some businesses might be interested too. For example, a small café near your local theatre might wish to use Broadway programs as part of their décor. Local theatre, historical group, or archives: Photos, pictures, and playbills from a local theatre may be of value to your community archives. Consider contacting these groups to make a donation. Online selling: Using online auctions sites (eBay) or classified ads sites (Craigslist, kijiji, Gumtree, etc.) will allow you to find buyers from outside your local area. Disposal: Paper items whose condition is too poor to sell can be recycled. Photos, posters, and other non-recyclables could be donated to a community group to be dismantled for a craft project or placed directly into the garbage. 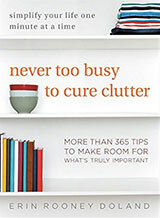 For those items you wish to keep, here are some ways to organize and conserve them. An archival 3-Ring Binder Box with heavy-weight, archival sheet protectors would be ideal to store and organize programs and playbills. You could slip a little acid-free index card in the pocket to record the date you saw the show, with whom you saw it, and a brief review. Labelled tabbed dividers can help further organize your playbills into subcategories. You could subdivide by year or by genre – whatever makes the most sense to you. Dirt and oils on your fingers can degrade paper and photos, so always handle the items carefully with clean, dry hands. When you’re organizing, avoid areas with food and drinks. If the kitchen or dining table is your only organizational space, cover the table with a clean cotton cloth before you start to protect your collection while you work. If your materials contain staples, remove them carefully and replace them with archival thread. However, closures such as sealing wax, ribbons, stitches, and unusual metal fasteners may enhance the value so when in doubt, leave these items in place. Temperature, humidity, and light will affect items in storage. Ensure that you store your collection in a suitable climate. Archivists recommend no higher than 21°C (70°F) and a relative humidity between 30% and 50%. You may decide to frame some posters or photos that have great meaning to you. We suggest that you use acid-free materials and UV-resistant glass when mounting your items. Hang your work out of direct sunlight to ensure it retains its beauty. Good luck with your collection Jackie. For more information on conserving these types of documents, check out the Northeast Document Conservation Center website. Are you living in urban studio apartment with a galley kitchen or a dorm with a shared kitchenette? If so, this post is for you. Small kitchens can become very functional with just a few adjustments. I’m one who knows. My family’s house has a small kitchen. When we first moved into the little summer cottage that would become our year-round home, the oven and refrigerator couldn’t be opened at the same time because the door of one would bang into the other. We’ve remodeled, but the space constraints are mostly the same. There is very little counter space, only a few cabinets, and we are a family of four. You can do the math on that one. To make it work, we’ve had to prioritize about what we really need, efficiently store the items we keep, and eliminate anything we can live without. Here’s how we’ve made it work. If the three most important things in real estate are location, location, location, the small kitchen mantra is prioritize, prioritize, prioritize. When storage and counter space are at a premium, every item must earn its right to be there. Go through your kitchen and decide if each item can stay or needs to go. Here’s an example. We got rid of the microwave oven after realizing all that it really offers is convenience. That is to say, it doesn’t accomplish anything that the stovetop and oven can’t do. It’s quicker, but getting rid of it freed up a couple cubic feet of space. We’re years into living without it now, and haven’t missed it one bit. Think about the bulky items in your kitchen such as the juicer, mixer, and coffee pot. (I know, nobody is going to give up a coffee pot!) Is there a smaller version? Can an item be eliminated entirely? Once you’ve culled the bulky items, consider the “must haves.” These are the things you can’t do without, like utensils, cutlery, plates, pots, and pans. For each item on this list purge down to only what’s necessary. Next, adopt a zero tolerance policy for unitaskers. There is no room in a small kitchen for the Jumbo Jerky Works Gun. Seriously though, these things take up space and almost never get used. Don’t just take our word for it. Celebrity chef Alton Brown breaks down exactly why there’s no room in your kitchen for these things. Here are a few other suggestions for living with a small kitchen. Stack up, not out. Like me, you’ll probably have more vertical space than horizontal. Store items near where they are used. Find things that work with your space, not against it. For example, a magnetic knife mount is much more efficient than a knife block when counter space is at a premium. Clean as you go. This is probably the best tip of the bunch. There just isn’t room to make a big mess, so clean up as you work. Here’s hoping this was helpful. Tiny kitchen life can be cozy and fun if you’re doing it right. Do we outsource our memory too much? Recently I started a new course that’s rather stressful and time-consuming. To prepare for it, at work, I wrote down everything I have to do between now and my August holidays. For Unclutterer, I didn’t do anything because Jacki has a lovely Google Calendar with all our publishing dates. And I informed my husband of when I would need to work on my course so that he wouldn’t feel ignored. All good things, right? Communication, written task lists, and using sharing technology to its fullest. The height of personal organization. But then, at work in doing one of my monthly tasks, I left half of it undone. Plus I didn’t go look at Jacki’s calendar and almost missed a publishing date (thanks for reminding me, Jacki). The only thing that didn’t go wrong was my relationship. I asked myself why that happened. I began by looking at my task list at work. When I’d written down the monthly task, I wrote down only the information for the first part of the task and nothing about the second. When I relied solely on my memory, I always went through a mental checklist to make sure I wasn’t missing anything. Having written it down, I didn’t feel the need to go through that list and didn’t even remember the second part existed and it’s something I’ve been doing monthly for over 3 years! Then I thought about the calendar and why I didn’t consult it. Lack of habit and assuming that I already knew it. I have to admit that last one is a biggie for me. I get convinced of something so much that I don’t bother checking to make sure that it is true. This led me to wonder about using lists, relying on memory, or employing technology. Which works best and why? With smartphones and prior to that day-planners, we have external memory devices around us all the time. No need to actually remember anything, right? But is that lazy of us? Over on Life Hacker, Thorin Klosowski did a personal experiment back in 2012 where he stopped relying on anything other than his brain to remember what he had to do and where he had to go. To make sure he did everything he needed to, he would walk himself through the day each morning, similar to what I did for my monthly work tasks before making the mistake of half-writing them down. He found the experiment extremely helpful and although he didn’t stick to a brain-only memory prompt, he did decide to rely less on paper and technology. Fascinated by Klosowski’s experiment, I thought I’d go see what else was out there and found an article in Wired from 2014 that looked at an experiment that tested people’s ability to remember things with or without the ability to write it down first. The results did not support note-taking as a memory tool. Those who relied solely on memory performed better. Moving up to 2016, Motherboard published an article about how using technology to remember tasks makes it easier to forget them. The author, Rachel Pick, was in a situation really close to mine — lots of commitments with different dates and requirements and no simple way to merge them all into a single list. She tried a physical planner, but just like me, she forgot to take it with her. She then tried apps, which were either too complex or too restrictive. She finally tried Google Keep (which I use to remember restaurants in other cities, birthday gift ideas for my husband, and things that we have to take to the cottage). And she liked it, so much so that if something wasn’t written down in the app, it was like it never existed. Being a curious person, Pick spoke with a neuroscientist to find out why this was happening. What he told her was basically what Klosowski discovered on his own — Pick was outsourcing her memory to Google Keep and was changing the way neurons were firing in her brain. What was the neuroscientists advice? Rely more on memory and less on tools. With so many things going on in my life, I can’t rely on just my memory, but what I have to do is start asking myself, “Are you sure that’s all? Are you missing anything?” and go through my mental checklists with paper and technology acting as prompts and light support only. For me, one of the most annoying parts of setting up a filing system is creating the labeled tabs on the hanging file folders. It’s a fussy and time-consuming process, dealing with those paper inserts for the plastic tabs. One solution is to avoid hanging file folders altogether and just use standard file folders, but that’s awkward for many people, given that many file cabinets are set up for hanging files. But there are other alternatives, and if you get as annoyed as I do with the standard plastic tabs, you may want to consider one of these. Erasable hanging folder tabs are the ones I’m going to try, myself. You can use them with the hanging folders you already have, although they cost about 25 percent more than the normal 1/3 cut plastic tabs do. (I much prefer the longer 1/3 cut tabs to the shorter 1/5 cut tabs, because you can have more meaningful filenames.) You need to use a permanent marker and a standard white eraser, which could be a minor hassle — but many offices I’m in already have those lying around. Alternatively, I’m guessing you could attach a self-adhesive label made with a label maker to the tab if you prefer that to handwritten labels. If you don’t already have hanging file folders, you might want to try the folders with built-in erasable tabs. You can get them in this moss color or in assorted colors, and there’s a box-bottom option if you need the extra space. However, these folders may be problematic for those of us who prefer straight-line filing, since the tabs come in sets with three positions: left, right, and center. If you want to use labels from a label maker, and don’t care about the erasable feature, you could buy similar hanging folders with built-in 2-ply reinforced tabs. You could also write on these with pencil and erase as needed, but penciled labels may be a bit too faint to read easily. The unusual Find It hanging files have a lower top rail so you can easily see the tabs on the interior folders — so you don’t need any tabs on the hanging folders. 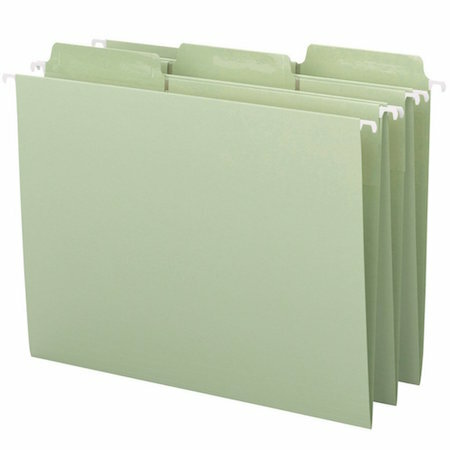 These folders can also help those who have file cabinets where normal hanging folder tabs don’t fit because of the drawer height. This solution assumes you use interior file folders in your hanging files, which not everyone does. (I often don’t.) But for the right person, these can be a great choice. 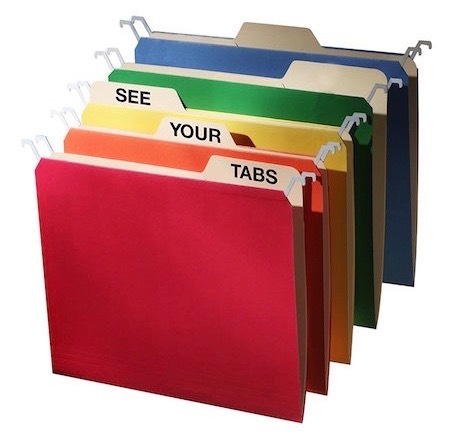 I know someone who gave away all her other hanging file folders and uses these exclusively. I’m not as anti-paper as Alex is, but reading his “paperless as possible” post inspired me to re-evaluate what’s in my two file cabinets. I was also inspired by a friend who is doing a major uncluttering — she found a box full of papers (bank statements, utility bills, etc.) from 1999. I didn’t think I had anything that obviously worthless (beyond a few expired coupons), but I sure came close. 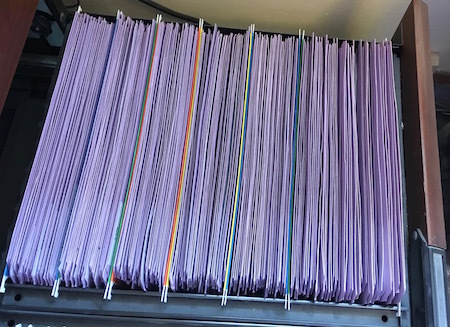 See all those lovely lavender-colored folders? Those were all my old client files. Some of those were from clients I haven’t seen since 2005. They were all nicely organized, but they were useless. There was really no need to keep anything except the client agreements — everything else was easily reprinted if I ever needed it. So I started going through the files, pulling out the client agreements and scanning them, and then shredding everything. 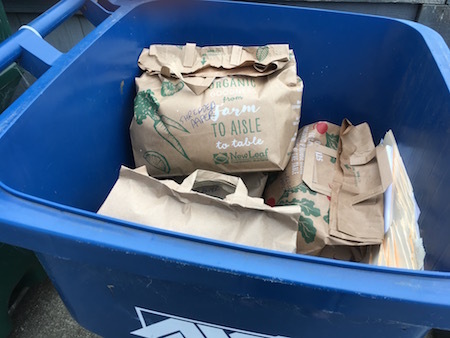 See my recycling bin, with paper bags full of shredded paper? And many more bags got added after I took that photo. I found plenty of other papers that were taking up unnecessary file cabinet space, too. Some were the kind of things so many people have: coupons for services I’ll never use, old restaurant menus, etc. As I’ve noted before, I expect to find (and discard) papers like these when I do a periodic file cabinet cleanup. But I also found another large group of unnecessary papers. Over 10 years ago I created a bunch of “idea books” with photos showing organized kitchens, entryways, garages, closets, etc. Now everyone (who uses a computer) can find plenty of aspirational examples of organized spaces on Pinterest and elsewhere. And if I wanted to suggest a product to a client, I’d just email a link. I don’t think I ever once used those idea books, and it was way past time to let them go. Since I kept them in hanging files in a file cabinet, getting rid of them freed up a lot of space. Now I just need to decide what to do with my newly empty Itoya Profolios. They’re very nice products, but I’m not sure I have any use for them. I’ll also need to decide what to do with the empty file cabinet space. I can’t easily get rid of either file cabinet — there are still too many files that I do want to keep. Also, the cabinets fit nicely into their spaces, so I don’t feel any need to have them disappear. Instead, I’ll probably use the empty space to store a few things that could use better homes than the ones they have now. This effort was a great reminder of how easy it is to become accustomed to keeping certain things — papers and more — without thinking about why we’re keeping them and if they’ve outlived their purposes. Does seeing bugs or spiders inside the house make you cringe, run away, or even scream? But does the idea of killing a living creature that’s just trying to survive fill you with guilt? Well, now there’s My Critter Catcher, a tool that can help you send the little monsters on their merry way without you having to actually approach them. 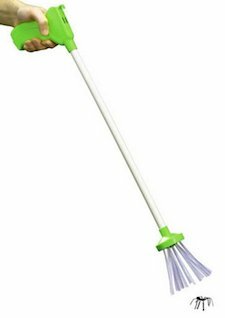 It’s based on the idea of those grasping tools that are designed for people with limited mobility, but instead of grips at the end of the tool, there is a soft-brush sort of scoop. When you see a spider or other insect roaming about the house, all you need to do is place the scoop over the little guy and pull the trigger, gently trapping it inside the scoop. Take it outside, open up the brushes and off the spider or bug goes, still alive and free. All without you having to get anywhere near it! Not sure, exactly how it works? Don’t worry, there’s a demonstration video with the young and the old showing us how convenient and eco-friendly the tool is. While watching the video, I found myself asking how they got the bugs to stay still long enough to slip the tool over them. In my house, no matter how quickly I try to scoop up bug (or to be more honest, flatten it with a paper towel — I’m more of a survival of the fittest type), they always seem to see me coming and get out of the way before I get to them. Thanks to my high school friend Cathy for posting this on Facebook (although the video was a different one, with a manly-man saving a woman from certain death-by-spider — I didn’t post that one because honestly who wants to see such rampant sexism?). No, I’m not going crazy, nor am I having a conversation with the laundry basket. I am, however, aware of what the laundry basket really is: a mid-station. Think of a train that leaves Boston for New York City but first stops in Hartford, Connecticut. Partway between its departure point and its final destination. That is the mid-station stop. If you wanted to, you could get off the train at Hartford, have some lunch, do some shopping, and then eventually continue to New York City. The laundry basket is a mid-station stop — holding the dirty clothes before they get to the washing machine. The trouble is, laundry often gets stuck in the basket. Days go by and the pile gets higher and higher. It’s annoying, and this prompted me to find other mid-stations in my home and I found several. The dish drainer is a classic mid-station. I’ll clean up after a meal, wash the dishes, and put them in the rack. A couple of days later, we’re all using the rack as if it were the cabinet. We also have a collection of keys, backpacks, and lunch boxes that come in from work and school every day. In this case, the mid-station is the mudroom. The coats and backpacks have hooks and the keys have a small basket, yet these items often languish on the first flat surface inside the door, or on the floor itself. What can be done about mid-stations? Adopt new habits. I live with three other people and laundry builds up quickly. After just 72 hours there’s a mountain piled up. The solution that works for us is to do at least one load per day. If we do this, the clothes don’t pile up as much. Doing one load per day, is manageable, and a lot better than spending three or four hours on the weekend getting caught up. As for the dishes, diligence is the answer here, too. Simply make it a part of the daily routine to empty the drainer and put the dishes, glasses, and utensils, away. Continually reminding the guilty parties results in getting the coats and backpacks hung up properly in the mud room. Eliminating mid-stations. I’ve read about people who’ve addressed mid-stations by eliminating them. In other words, laundry won’t pile up in baskets if there are no baskets. Likewise, there’s no “Leaning Tower of Dishes” to admire without a dish drainer to serve as the foundation. This is true but not often practical. When I was a kid, we didn’t have laundry baskets because my parents’ house had a laundry chute. We tossed the dirty clothes through a little door in the wall and they fell downstairs to the laundry room itself. Most homes don’t have laundry chutes these days. If you can get away with eliminating a mid-station, give it a try. I don’t think I could do it. The other point I want to make here is delegation. My kids, my wife and I all share chores. Many hands make for short work, as the saying goes. If you’ve identified any mid-stations in your home, share your solution (or struggle) in the comments below. Let’s see what we can do about this common problem. In my post about conference handouts, a reader asked me how I manage to live/work without a filing cabinet. The easy answer is that I’ve organized both my work and personal life in a way that I don’t need to keep papers. And that’s it. Seriously. We don’t have children, so no need for filing report cards, badges, artwork and such. The Spanish medical system is centralized and efficiently run, so I don’t need to keep any of my own medical records. Apart from this writing gig, I don’t run my own business so don’t need to hold onto any receipts or the like. And since I’m rather anti-paper, I recycle almost everything that comes into the house. Finally, taxes are all done online and are accessible throughout the year, meaning I have no need to keep previous years’ tax forms. At work, my role as Academic Director is about as paperless as a job can be. All my written communication with staff is done through email or WhatsApp. Student reports are stored in Google Drive spreadsheets and sent to parents monthly. The paper reports the teachers fill out are kept in one of three inbox trays (one per trimester), and in June they are all shredded. And as I have no part in the administrative/financial side of the business, I don’t have any legal requirements to hold onto anything. When I still lived in Canada, however, and ran my professional organizing business, I had to hold onto more paper, but I still didn’t have a filing cabinet, or even a drawer. Instead, every year, I bought myself a plastic multi-pocketed folder with an elastic closure. On the tabs for each pocket, I put the expense/income category and every day of the week, I would take five minutes to update my accounting program with anything new and store the piece of paper in its corresponding category. The folder lived on top of my desk, beside the computer, easily accessible, portable and tidy. When the tax-year finished, the folder would go in an airtight plastic bin in the basement, and I would buy myself a new multi-pocketed folder. I had such a simple filing system because I am a horribly disorganized person. I studied library science and records management but almost never worked in the field because I could never decide on just one set of stable categories. When asked, “where should I file this?” my brain would come up with at least 10 different options depending on the context of the potential future search. 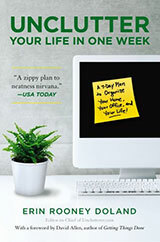 Through many years of trial and error, I discovered the best way to be organized is to have as little as possible, and in more recent years, have as little legal responsibility as possible. Now it’s time to turn the question to all of you: at home and at work, what papers do you honestly and truly NEED to keep and what are you keeping out of habit? And once you’ve figured that out, check out Jacki’s article about organizing documents at home or the Office Organization archive for tips at work. Passwords, passports, umbrellas, scarves, earrings, earbuds, musical instruments, W-2s, that letter you meant to answer, the permission slip for your daughter’s field trip, the can of paint you scrupulously set aside three years ago for the touch-up job you knew you’d someday need: the range of things we lose and the readiness with which we do so are staggering. Data from one insurance-company survey suggest that the average person misplaces up to nine objects a day. I’m a pretty organized person, but I’ve certainly misplaced things. I recently left my iPad behind in the front desk of the organization where I volunteer on Monday mornings. I noticed it was missing on Monday night and knew where I must have left it, but I had jury duty early the next day and couldn’t go pick it up. Fortunately, a neighbor did that for me. I’ve also sometimes left a sweater or jacket behind after working with a client. And just recently I misplaced a Visa bill and had to call to ask what I owed so I could make the proper payment. Looking back at these instances of misplaced items, I can see where I went wrong and define strategies to avoid such problems in the future. I know this might seem obvious, and I’m normally good at having homes for my things. For example, I don’t lose my glasses or my keys because they always go in the same place. But exceptions to the rule can cause me problems. I have a place for bills to be paid, but I set my Visa bill down somewhere else “just for now” rather than taking the 20 seconds to put it away properly. Bad idea! I know that, but we all mess up occasionally. Misplacing the bill was just a reminder not to get lazy about putting things away properly. This is especially important with things like papers which can so easily get buried. When I first started my volunteer work I thought it might be handy to have my iPad with me. Since then I’ve realized it doesn’t really help, so now I leave it at home. I can’t leave something behind if it didn’t come with me in the first place! The fewer things I carry when I’m out and about, the less chance there is I’ll lose something.